November 6, 2018 - Great news for SiteSwan Website Builder white label resellers! Opportunity knocked, and we whipped the door wide open to serving some of the fastest growing industries in your markets thanks to our new integration with AgeVerify.co. Business is booming in hometown beer. According to the Brewers Association, the number of small and independent craft brewers grew another 16% in 2017, with a total now eclipsing 6,300 on Main Street, USA. Local wineries are experiencing similar growth. And with the surge in alternatives to conventional cigarettes comes phenomenal growth in local retailers catering to electronic alternatives and other vaping products. 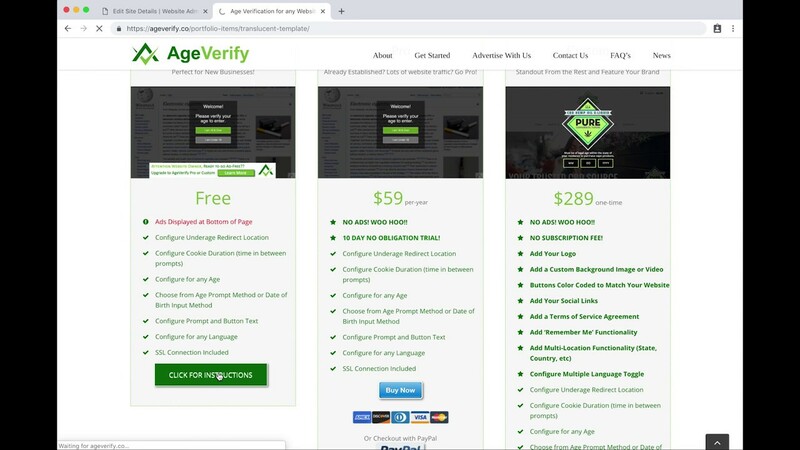 Our preferred third-party age verification provider AgeVerify.co has just released this quick and easy How-To Demo, specifically for our white label resellers. The installation instructions for the SiteSwan platform include all of AgeVerify's templates in this short YouTube video below. We're excited to provide our latest platform integration, a powerful solution that opens new markets. Demonstrating again that SiteSwan is more than just a website builder -- it's a complete web design business-in-a-box. And reaffirming our relentless commitment to continuously enhance the powerful suite of tools that literally includes everything you need to start building and selling websites to every category of local businesses in your area. Even if you've never built a website before!